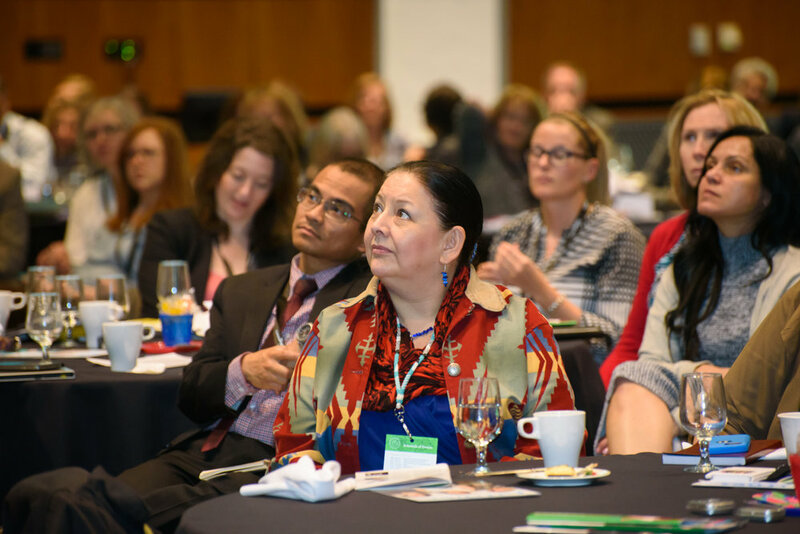 Connections 2018 gathered 300+ empowering leaders from Alberta’s nonprofit, corporate, and public sectors to challenge each other to Think Differently about our approaches to leadership, reconciliation, caring, collaboration, and more. We are thrilled by the inspired connections made at this year's event! For more information, visit www.calgarycvo.org. Hosted at Mount Royal University on April 11-12, our 5th annual Connections Conference was a smashing success! We discussed the shifting landscape facing all of us, big discussions, big ideas, and provided meaningful takeaways causing sparks within our community. CCVO’s annual Connections Conference brought together leaders from Alberta’s nonprofit, corporate, and public sectors, connecting regarding contemporary policy issues and government initiatives. Keynote speeches and session topics focused on issues that matter most to sector stakeholders: the people, funds, systems and policies that affect sector organizations and the communities we serve. An exceptional line-up of speakers provided insights, practical tips and information to help spark dialogue between nonprofit leaders, government, funders and the corporate community. Over two days, more than 350 passionate and highly engaged participants from nonprofits, corporations and our provincial government met to share ideas, make new connections and be inspired to take bold action to strengthen our communities. Tweeting up a storm, #connectionsyyc was trending right out of the gate, as delegates shared their take-aways from our engaging speakers Jocelyne Daw, Amanda Lang, Rt. Hon. Joe Clark, Bob Wyatt and Ashley Good. Connections 2013 brought together over 320 leaders from the nonprofit sector, corporate community and government to learn from one another, make connections and dialogue about the significant changes that will impact the nonprofit sector and its ability to meet future community needs. Keynote speakers included Dan Pallotta, a pioneering social entrepreneur, and Bob Wyatt, Executive Director of the Muttart Foundation, Lloyd Axworthy, president of the University of Winnipeg and Dr. Lester Salamon, Director of the Johns Hopkins Center for Civil Society Studies. Connections 2013 Promotional Video Please click here for a post-event testimonial from CCVO.